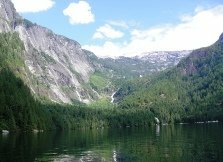 Imagine getting off the ferry in Langdale and being able to mountain bike or hike all the way to Earl's Cove through approximately 80 kms (50 mi.) of uninterrupted nature. Last fall the Sunshine Coast Regional District made the dream a reality with the completion of phase one of the Suncoaster Trail connecting Earl's Cove to Halfmoon Bay. The trail has been designed to accommodate hikers, bikers, horseback riders and in certain portions, even ATV's. Phase one of the Suncoaster Trail is 37 kms long, about two metres wide and travels through old Crown land forest roadways and trails along a series of beautiful lakes. There are exit points near Sunshine Coast communities giving users access to some of the Coast's finest accommodations and services. Entering the trail at Earl's Cove the first lake you will encounter is Klein Lake where there is rustic, lakeside camping for those who want to stop overnight. If you travel about another 1/2 hour to an hour you will reach Ruby Lake and Ruby Lake Resort via the nature trails of the Iris Griffiths Centre. The Resort has a wonderful restaurant with the best northern Italian cuisine on the Coast as well as offering first class accommodations in their lakeside resort. If you continue along the Suncoaster Trail you will almost come down to the highway and you will see that the trail becomes more of a manicured gravel path. At this point, across the road is Sakinaw Lake Rd. On a hot day, if you detour down this road, you won't regret it because there is a great spot to have a quick, refreshing dip in the lake. If you plan ahead, you could stay at the luxurious Sakinaw Lake Lodge and experience the peace and tranquility of this beautiful area (and also their wonderful breakfasts). Just past the golf course, at McKay Road it is necessary to travel on the highway for several kilometres to Menacher Road. (In actual fact there is a trail through here, but it is not officially part of the Suncoaster because there is a bridge over Anderson Creek that is not wide or strong enough for ATV's - click here to check it out.) Be sure to stop for a bite to eat at the roadside grill where you can get a cold drink and a burger to sustain you until your next stop. If you want to make another detour, head down Garden Bay Rd. until you get to Garden Bay Lake where again you can refresh with a swim in the crystal clear lake. The Katherine Lake Regional Park entrance is across from Garden Bay Lake and offers great campsites and a sweet lake for swimming. This campsite has washrooms and showers as well. Click here for more information about additional accommodations and restaurants in the Garden Bay/Pender Harbour area. Getting back on the road (or trail again) you will need to make your way back out to Hwy. 101 if you made a detour and turn right and within a couple of kilometres you will come to Menacher Rd. on your left. This road will take you up off the highway and back on the Suncoaster Trail. After a bit of a climb, this next section of the trail mostly follows old forest service roads, is well signed and a bit remote. After several kilometres you will reach Homesite Forest Service Rd. This is the official end of phase one. At this point, you can turn right and head down to Hwy. 101 and turn left to follow it approx. 13 kms into Sechelt. 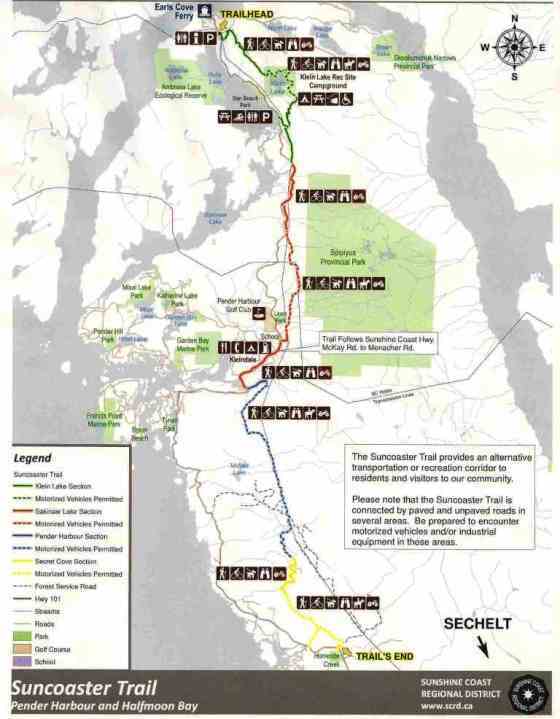 However, if you think you'd like to take a back roads and trail route into Sechelt click here for directions. To see closer views of each section of the completed trail, click on the section in the map or you can click on the links below. Click here to return from the Suncoaster Trail to the Home page.